On May 25, 2018 General Data Protection Regulation will come into force. If you are working with EU customers and processing their personal data, you store has to follow GDPR requirements. 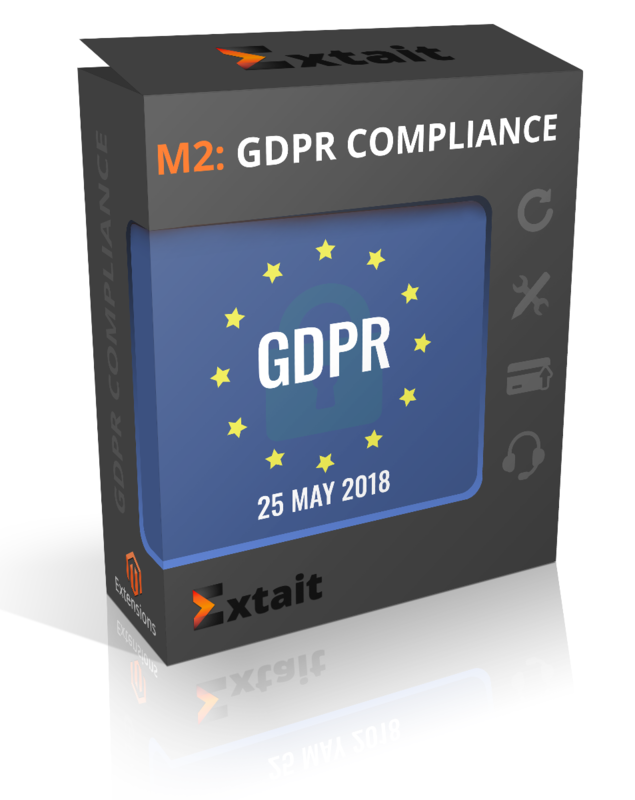 The extension helps you to prepare your Magento store for GDPR hands down. In a few words, GDPR, or General Data Protection Regulation, is a new regulation in EU law on data protection and privacy relating to all individuals in the European Union. It concerns the exporting, keeping and processing of personal data outside the EU. To be in line with the new law, every website struggles to be keeping with a number of requirements towards the way they manage private data. Carefully scrutinized the law, we’ve made up a list of features which help online merchants to prepare their stores for GDPR. Important! We guarantee the bug-free functioning of the magento extensions only on the default theme. The Magento 2 GDPR extension is very flexible. According to your needs and specificity of your store, you can enable or disable any part of the functionality. 1.You can delete personal data via the default Magento way, except orders and reviews data. 2.You can delete personal data including reviews and replace orders data with anonymous data. 1.Data can be deleted directly from the management section of an account. 2.A customer has to request the deleting of data. He/she also receives an email to confirm this decision. By default Magento deleting not all personal data is erased. Orders and reviews are remained. You can set the period to store this information if you want to save it for certain reasons. Specify a necessary email in configurations to get notifications of customers’ delete requests. So, you will always know about new ones and can fulfill them in a short period of time. Be informed of all deleted customers’ accounts and unsubscribed users by getting notifications to the email you enter in the settings. You will receive notifications whether you set deleting with or without request. According to the GDPR law, customers can request to get personal data in common use and machine-readable format. To simplify the process, with the extension you can export all customers personal data to CSV format. Specify email to get notifications of data exporting. Select a template as well as an email address for sending. So you as admin will always see how many requests customer have made and control data. Add a special Data Export section to customers’ accounts. So registered customers can export info right there. For other customers you can create a link in the footer to show a popup. There a customer can enter an email into a special field, where data concerning will be sent. If a visitor has earlier made orders and then decides to create an account, all data will be transferred to this new account. It is very convenient to store collected data about one user in one place for an admin and for customers as well. Show a popup for customers to accept using cookies. The text of popup can be customized. Using the popup customers can agree with cookie usage policy. In case they do not want to confirm, there is also a link to visit a page with instructions how to disable cookies in any browser. Any customer should verify the age on Registration, Login, Review and Contact Us Forms. The only thing that must be done is ticking the check box. Moreover, visitors can do it on Newsletter Subscription Form in the footer and on Check Out Form. If a customer doesn’t mark a checkbox to confirm the age on the following forms: Registration, Checkout, Contact Us, Newsletter Subscription forms, and when leaving a review, he/she will see an additional field to enter a parent email for receiving a notification to confirm child’s registration. When customers create an account, they need to confirm that their age is over 16. If they do not tick the check box, a field to enter a parent email appears. So, parents will receive a notification to give the consent for children’s data processing. - The text of the message about the child data sending was corrected. - The sending of notification about allowing the use of child data was fixed.